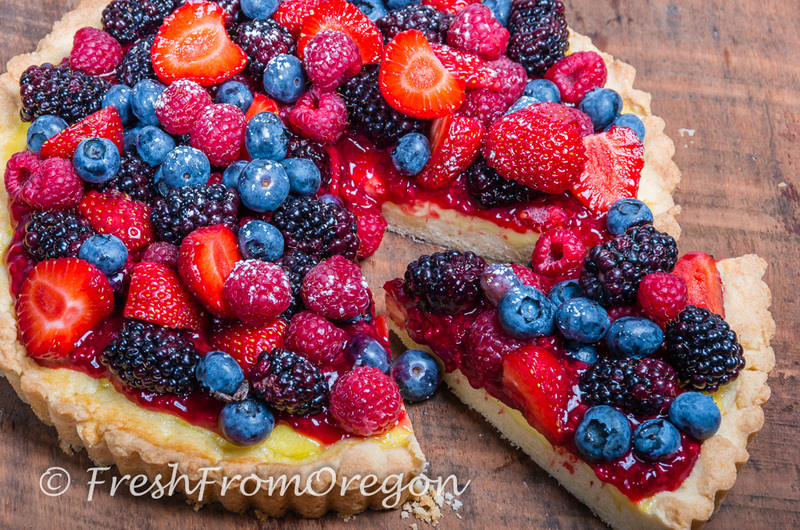 Fresh berries in all shapes and colors are now ready in Oregon. The fruit stands are overflowing with fresh strawberries, blueberries, blackberries red raspberries and tayberrries. You will always find a pint or two of berries in my refrigerator ready to create a sweet dessert or muffin or just to top off my Sunday morning pancakes or serve with some yogurt. 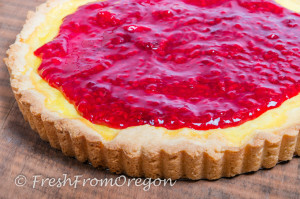 The sugar cookie crust in this tart is sweet and crisp and much firmer that a traditional pie dough crust making it last a few extra days in the refrigerator without getting soggy. 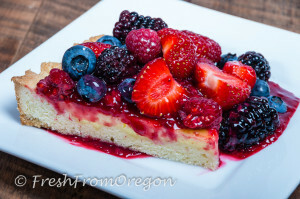 The sweet taste of the lemon filling with the sauce from the tayberries and the mountain of berries creates layers of flavor from top to bottom. What is a Tayberry? Its a cross between a blackberry and red raspberry and the fruit is sweeter than a blackberry and much larger than a red raspberry. The name comes from the river Tay in Scotland. To make the sugar cookie crust, place the butter and sugar in a standing mixer and beat until light and fluffy, about 3 minutes on high. Add the egg and mix on medium until fully incorporated. Add the flour, baking powder, and salt all at once and mix on medium just until no spots of flour remain, about 20 seconds, do not over mix. Wrap the dough in plastic wrap and refrigerate for 30 minutes. Preheat the oven to 350 degrees F. Lightly spray fluted 9 1/2″ removable bottom tart pan with cooking spray. While the oven is preheating, make the lemon filling by whisking together the eggs, egg yolks, whipping cream, lemon juice, and granulated sugar until smooth. Remove the cookie dough from the refrigerator. Press dough it into the tart pan evenly on the bottom and up the sides. Pour the lemon filling into the crust. Bake until the filling is set and the crust begins to turn golden, 20-25 minutes. Do not over bake – pull the tart out just when you see any golden color on the crusts. Make sure the lemon filling is cooked by inserting a toothpick in the center and checking to see if it comes out clean. 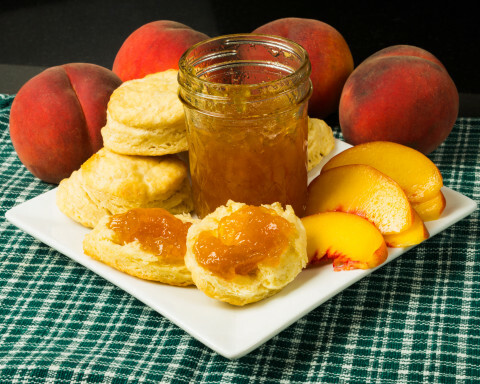 Allow the shell and filling to cool completely at room temperature. Refrigerate until ready to serve. To prepare the topping add tayberries or red raspberries and sugar to a saucepan and bring to a boil. Meanwhile, in another small bowl combine cornstarch and cold water; whisk until smooth. Add cornstarch mixture to raspberries and whisk to combine. Bring to boil and continue boiling 3 to 5 minutes or until sauce is as thick as you like. Set aside to cool. Sauce will thicken as it cools. 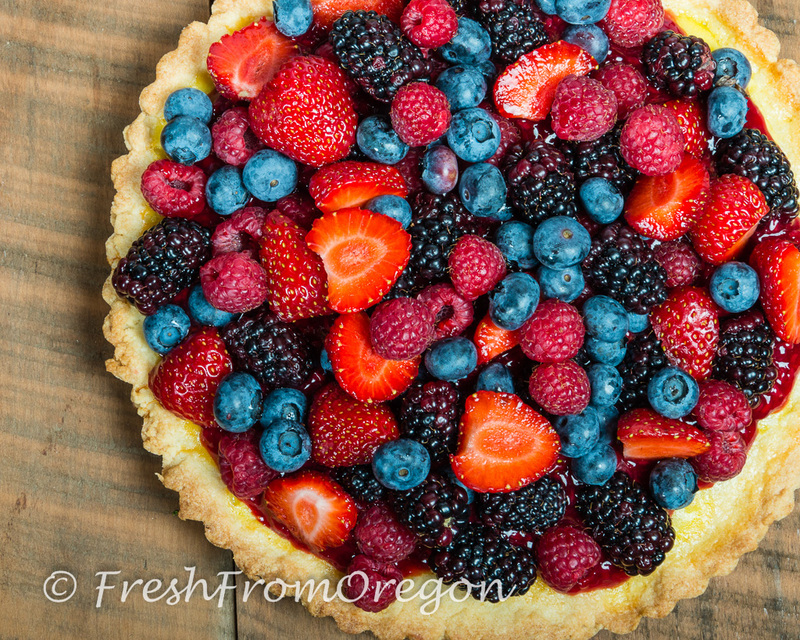 To assemble spread raspberry sauce over the lemon filling and place mixed berries on tart and sprinkle with powdered sugar. Serve chilled. New Years Traditions ~ What’s yours?